Commissioning a work of art is an opportunity to acquire exactly the work one desires for a particular site in a home or commercial space. This is an interactive process, a collaboration between artist and client. 1.Preliminary discussions of image, determination of proportion, size, and schedule. 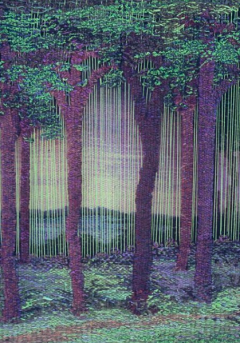 2.Colored pencil drawing of purposed landscape in proportion to the tapestry. 3.Ordering of silk, wool, and linen, and the weaving of the tapestry begins. 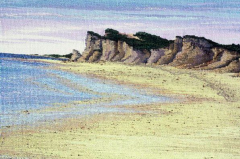 4.Delivery and installation of tapestry on site. Please contact me directly for details and payment schedule.